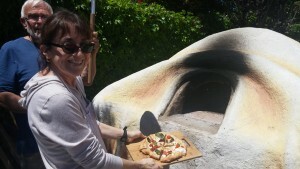 The Westchester Community Oven is a community wood-fired bread and pizza oven located at the Community Garden at Holy Nativity. The Oven is open to the general public, with the support of trained OvenMasters. 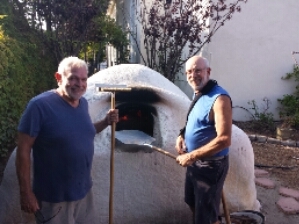 The Oven was hand-built by over 100 volunteers from the community, using adobe bricks as the base, and using cob-style building for the dome. 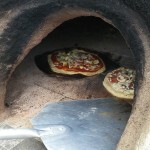 The Oven is open to the public on the second Saturday of each month. 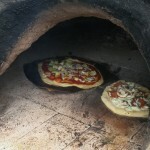 Pizza can be made around lunchtime, and bread in early afternoon (times are subject to change – check posts on Los Angeles Bread Bakers meetup for exact times for the date you are planning to attend). Since the Oven needs to be covered during rainstorms, events are cancelled if rain is forecast. eventually, a forest garden will surround the oven. A “Pizza Garden” with culinary herbs is now growing. Size: The oven is 7′ in size, which is community scale. This is far, far bigger than most home pizza ovens, which are typically about 4′ to 5′. 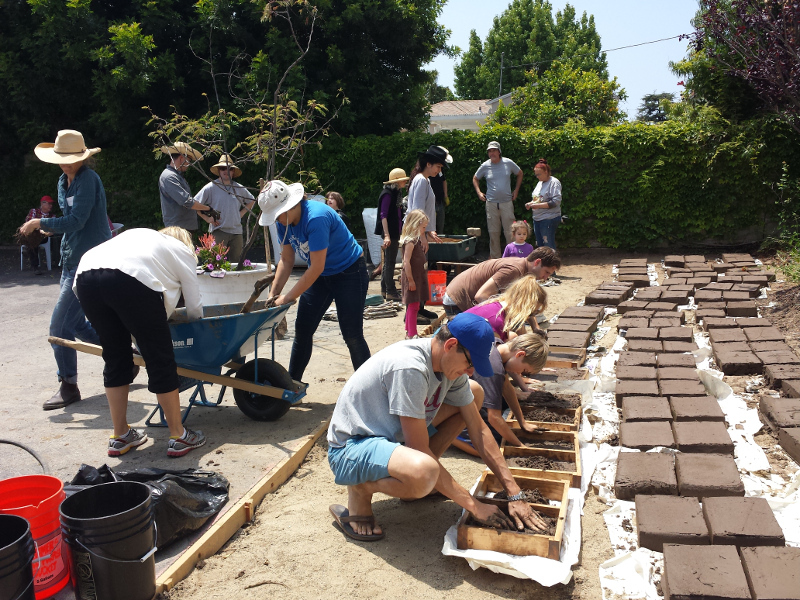 Time: More than 100 volunteers were part of the overall build, from demolition, to adobe brickbuilding, to cob building. The build process took about 3 months, including drying times and weather delays. 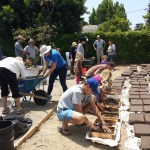 Materials: We hand-made 288 adobe bricks, which were used in the base of the oven. 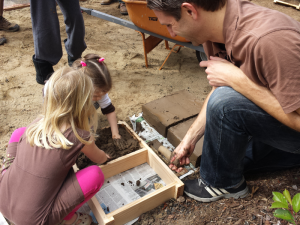 The fill material inside the base of the oven includes broken concrete, old cement garden features, and gravel. 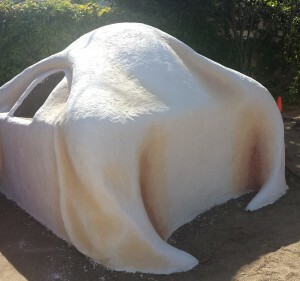 The cob dome and covering material is a combination of donated clay, plus sandy fill dirt, in percentages that varied by layer. Some layers had straw added, but most did not. The finish layer includes a traditional preservative, homemade from fermented cactus. The exterior of the oven is painted with pigments which are often used in ceramics. A poplar door is soaked in water and used to regulate heat; this can be seen in some photos (not present in most construction photos). A thinner plywood door is used between bakings, to keep animals from moving in! Cost: Many materials were scavenged or donated. Most tools were borrowed. Our largest costs were renting a lowboy for asphalt disposal, and having the sandy-fill dirt delivered because we had inadequate material on our urban site. We purchased firebrick for the hearth, and rented some of the heavy equipment. Our budget for this community-scale project was about $2,100. Fuel: The oven burns wood — ideally fruit wood, like peach and avocado. The fire goes in the opening, and when the oven is up to temperature, the fire is removed (scooped out into a metal container), and the bread is put in the oven. 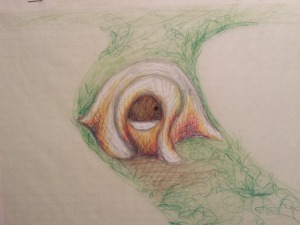 Although some cob ovens include a wood storage cavity in their base, this one does not. Baking: In early measurements, this community-scale oven seems to take approximately 100 pounds of wood and 4 to 6 hours to reach ideal bread-baking temperatures (shorter for pizza). This oven is large enough to bake nearly a dozen loaves of bread at a time. If you are interested in commercial-scale baking, please note that it is not legal to sell goods that are baked in an outdoor oven — and being as this is a church site, we should aspire to remain on the right side of what’s legal. However: the Community Kitchen at Holy Nativity is a commercial kitchen, available for rental by bakers and cooks. Please phone (310) 670-4777 for full details. Garden: The oven will eventually be nestled into a forest garden. A Pizza Garden of culinary herbs for use during the pizza events has already been planted. Other features at the Garden include four types of rainwater harvesting, two mini-orchards of dwarf fruit trees, an herb garden, many citrus trees, on-site composting, a meditative labyrinth, and live bunnies.